Every 10 years a most noteworthy cultural event takes place In the Bavarian village of Oberammergau, in the south of Germany along the Austrian border. This spectacle of theater first occurred in 1634. Its inception came about as a result of the residents of the German hamlet collectively vowing to perform the “Passion” of Christ once every decade if God spared their town from the ravages of the Black Plague. When looking at The Passion Play through a lens of non-religious implication, an ancient theme unfolds as timeless as Man’s ability to tell stories – the morality tale. As the sacrificed Messiah, Christ represents all that is thoroughly good and pure and his executors and those calling for his crucifixion are the forces of absolute darkness and unadulterated evil. Much like how the influences of the planets Saturn and Jupiter have traditionally been seen until recent times. When looking at the Solar System through a lens of religious implication, archetypally the planet known as “The Great Benefic”, aka Jupiter, can be likened to God the Almighty and its planetary counterpart otherwise called “The Great Malefic”, Saturn, represents The Devil, himself. Come this December 23rd, a 3 year long cosmic Passion Play shall take place in the heavens with the planetary Devil, Saturn entering the sign ruled by the planetary Almighty of Jupiter, Sagittarius. Occurring even more infrequently than Oberammergau’s religious pageant, this planetary Passion Play of Saturn transiting through Jupiter’s ruling sign of Sagittarius happens only once every 29 years. Of the four elements, Saturn is most uncomfortable within Fire. The Great Malefic’s influences function worst in the sign of “Saturn’s fall”, better known as the first of the Fire signs, Aries. The ringed planet fares only slightly better in the sign of its “detriment”, otherwise known as the middle representative of Fire, Leo. However, it is with the last representative of the Fiery element in the sign of Sagittarius, where the essence of the heavenly body named “The Lord of Karma” is pitted in diametrical opposition against the dynamic energies of its transiting sign, reminiscent of the most ancient of morality tales or Passion Plays. Similar to how the traditional Passion Play is staged within a structure of defined good and evil, The Lord of Karma’s upcoming trek through Sagittarius joins two cosmic influences which couldn’t be any more diametrically different from each other. Before venturing any further, a few cosmic points must be emphasized. Nothing in astrology, or throughout the karmic Universe for that matter, is “all good” nor “all bad”. And while we’re at it, neither sign nor planet exists that’s “best” or “worst”. Although the structure of the Passion Play is based on the opposition between ultimate good and evil, in astrology nothing can be defined with such an absolute perspective. Even so, Saturn’s transit through Sagittarius is the closest assimilation to an astrological absolute one could hope to find. For centuries, traditional Astrology viewed anything which concerned the planet Saturn was to be feared and its influences were unequivocally negative. Conversely, that which was associated with the heavenly body of Jupiter was unquestioningly blessed and advantageous. It is only until the latter part of the 20th century that a less absolute, more balanced perspective of the two planets’ influences has been established, with both possessing just as many good aspects as they do bad ones. 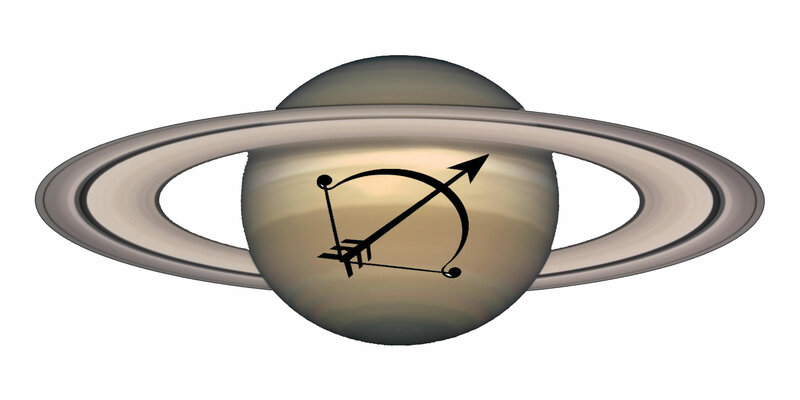 For example, despite Saturn ruling over such “non-blessed” aspects as restriction, loss, and pain, itself, the ringed planet oversees such positive things as productivity, status earned through hard work, goal achievement, discipline, and tangible reward or compensation for our concentrated efforts. Conversely, although Jupiter rules over such “blessed” things as Luck, abundance, and overall good fortune, the King of Planets has just as much involvement in the negative spectrum by governing over such non-blessed aspects as gluttony, condescension, whining, and the two most common unevolved flaws of the Jupiterian kind, hypocrisy and empty promising. At their core essences, Saturn is the planet of Work and Sagittarius is the sign of Luck. “Work” and “Luck” are concepts which barely, if ever cross paths, but each possesses an inherently strong dislike of the other, just the same. When applying the two concepts to both the ringed planet and the sign of the Centaur, the reasoning for this strong dislike makes itself abundantly clear. Saturn is considered an “Earthy” planet and the foundation of the element of Earth is based strictly within the tangible plane. Said another way, what one can see, touch, taste, feel, and smell. When applying the tangible to the Saturnine personality, the element of Earth is best represented by the money a person has, the possessions they own, and most importantly with the work output they do. With Saturn placing such high significance on the material plane, along with “Work” the ringed planet’s other most important Life concept is “Status”. And from the Lord of Karma’s perspective, only one “thing” can guarantee the raising of a person’s status in Life – the sweat and elbow grease of hard work. But hard work, in and of itself, doesn’t automatically make the grade for the Saturnine work ethic. The most effective labors are best executed with a higher sense of future status in mind. To really earn The Great Malefic’s respect, one’s work should ideally be a productive synthesis which reflects the ringed planet’s two biggest priorities of Hard Work and Status. In other Saturnine words, hard work optimally functions when it is goal oriented. Saturn may be associated with hardship and The Devil himself, but many aren’t aware of the astrological fact that The Lord of Karma rewards those who complete their goal driven work by means of tangible gain and noticeably elevated status. Those ruled by Jupiter set goals with their work too…..sort of. With the King of Planets overseeing the concept of “expansion”, many of his subjects tend to come up with career goals befitting an Olympian god or Superman, rather than within the reach of mere mortals. Inherently jumping to the “big picture”, Jupiter’s children can easily picture themselves at the pinnacle of their achievements many times without the slightest clue as to how to get there or what direction they should take. The absence of their detailed map to Mt. Success isn’t surprising, given Jupiter’s children tend to rely on their inherently good Luck and fabulous sense of timing, rather than tenacity, discipline, and that other thing which resides in The Great Malefic’s domain – Hard Work. For the vast majority of Saturn’s children, the word “Luck” doesn’t exist within their vocabularies. While we’re at it, neither do the words: “Vacation” or “Relaxation”, either. Because the Lord of Karma is the Taskmaster of Work and Labor, as mentioned earlier, the only thing that can guarantee the elevation of one’s status in Life is hard work. When the concept of Luck is personified, another way of saying when an inanimate force is supplied with human traits or qualities, it will often be depicted as being mentally compromised along with an acute case of near-sightedness. Why? Luck is both dumb and blind. The Force of Fortune we call Luck is haphazard and random. We do nothing to earn it, Luck simply lands in our laps for no definable reason. Those who are Jupiter ruled have a propensity to be consistently lucky and possess an uncanny knack for being in the right place at the right time. Unfortunately, Jupiter’s subjects can get too used to their atypically good Luck, or to “things going their way”. This over-reliance on Luck’s over-abundance can eventually lead to an equal over-abundance of such non-lucky things as: Irresponsibility, Carelessness, Unreliability, and Recklessness, just to name an unevolved few. Where Luck is relied upon by Jupiter’s own, the Lord of Karma negates it by never allowing the Saturn ruled to rely or even believe in this unearned Force of Fortune. Now that we have a firm grasp on the foundations of both Saturn and the Jupiter ruled sign of Sagittarius, let’s combine them to see how the world’s upcoming Passion Play unfolds for the next 3 years when the influences of The Great Malefic and The Great Benefic are joined together as a single force of astrological influence. In Part II, Brad will discuss the overall dynamic created when the planet of restriction joins forces with the sign of abundance and how it will affect the residents of Earth over the next 3 years.